Although setting the tone for innovation is important, the production process is where the action takes place. 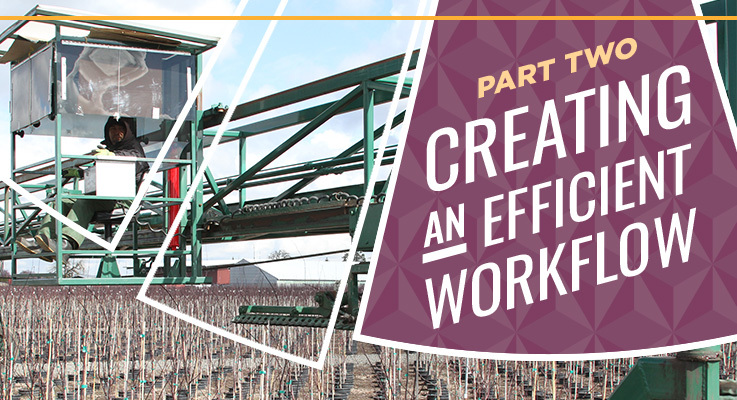 Companies like Alpha Nurseries of Salem, Oregon; Robinson Nursery of Amity, Oregon; Woodburn Nursery & Azaleas of Woodburn, Oregon and others have realized great savings from revising their production processes to make them more efficient. Zielinski noted that Alpha used to hire people to solve a problem before spending money on automation or equipment, because equipment is, by its nature, specialized. “We saw labor as flexible because it can do something else,” he said. A key Lean precept is that the pace of work matters, and is especially critical with processes involving multiple employees. 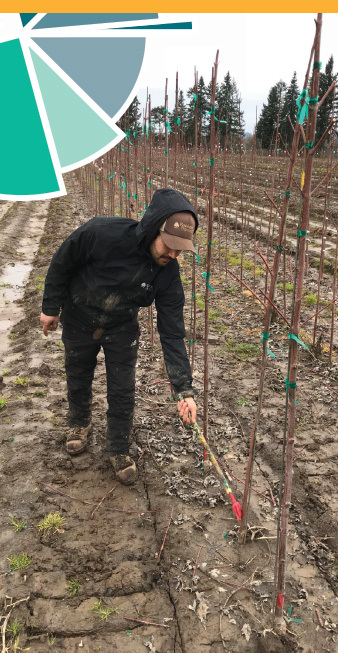 Corey Hill, operations manager at Skagit Horticulture, recalled a struggle for moving batches of plants on trailers in the field. The leader of his move crew remedied the issue with a simple analogy: He drew a visual diagram of a chain on two side-by-side sprockets, pointing out that if one sprocket turns faster than another, the chain bunches up and comes off the system. The broken chain concept works just the same for the move crew — if the pick-up people work at a different pace than the set-down people, there will be slack in the chain. Sprockets and chains are a strong metaphor for how work proceeds smoothly if all pieces run at the same pace. Next, the leader created a new series of laminated task sheets showing the standard work. It gave everyone their set of tasks and, most importantly, a time limit. Robinson Nursery revised its process of coding trees. The nursery color-codes all of its trees with a dab of paint near the base. For employees, this was backbreaking labor. They had to bend over for long periods of time — long enough to code the hundreds of thousands of trees the nursery raises each year. According to general manager Chris Robinson, it took a new employee with a fresh set of eyes to see a better way. Any improvement than makes work easier and more comfortable for the employee is a good idea. Trimming of nursery material is an important, but labor-intensive, task. Woodburn Nursery & Azaleas automated this process, inventing its own pruning machine for pot-in-pot production areas. Spanning 60 feet, this giant machine trims row upon row of material with only a single operator. The machine has lawnmower and sickle bar attachments. The cutters can move laterally and vertically, and can also be rotated. The machine itself has rotating tires so it can move forward, backward and sideways. The machine, which was inspired by a cauliflower harvester, is an effective way to prune anything that can be flat on top. Some manual touchup is usually required after the machine has made one pass over an area, but it still saves time over doing it all manually. 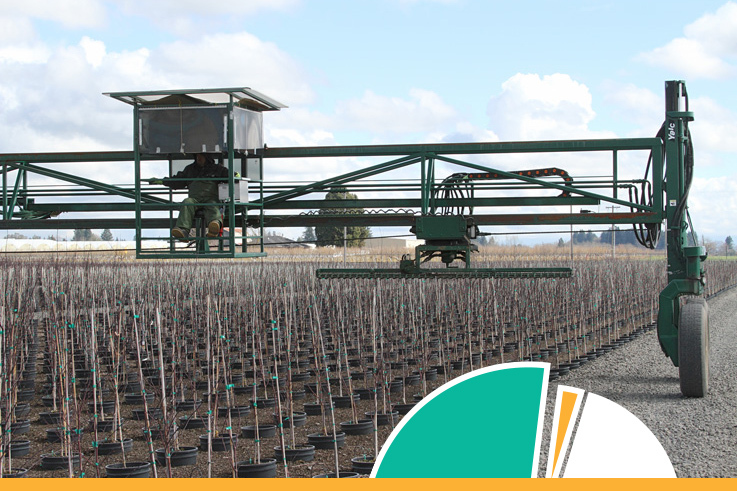 Similarly, Eshraghi Nurseries uses a shaper/trimmer that runs on conveyors and is used to trim containerized plants one at a time. They use it on conifers, deciduous shrubs and evergreens. According to Terry Menninger, plant maintenance and plant health manager, one chief advantage of the machine is that it keeps the process moving — which, in turn, keeps production humming. Of course, mechanization can also help improve efficiency at a nursery operation. Van Essen Nursery is now using mechanical digging for a much larger percentage of digging than it used to. Not only is the process more efficient, but it reduces the pressure on the nursery to find hand diggers. “We are able to use more of our regular crew for the digging process,” Van Essen said, adding that the nursery plans to look at improving its potting process and plant moving operations next to find more efficiencies. Potting machines have been around the nursery industry for a long time. However, there’s a new awareness that automating a process won’t necessarily make it more efficient. After Eshraghi Nurseries put in a new potting machine for large containers from #10 to #25, it initially processed 900 plants per hour. Although that is excellent, the nursery had the Oregon Lean Consortium help review the potting process, paying close attention to the interaction between crew and machine. The surprising conclusion was that one additional worker was needed. Upon implementation, output doubled from 900 to 1,800 plants per hour. Each nursery must look at its own specific potting process and products to determine the optimal crew size and assigned tasks for each job on the line. JLPN staff budgeted for expensive laser counters for a fabrication line, which were installed without testing. However, the counters did not work as efficiently as needed, and there wasn’t time to try and make them work while production was underway. Although the money was spent on the laser counters, Lewis didn’t feel the need to keep using them.